It was Jesus Christ who prophesied of the end of this age. It was the Messiah who said the advance notices of His imminent return would be telegraphed ahead by WARS, FAMINES, PESTILENCES and EARTHQUAKES — which would grow in magnitude and eventually reach out to affect the lives of EVERYONE! (Matt. 24:6.) The DAILY NEWS reports that at least 30 wars, conflicts, and insurgencies are in progress today. Ten are in Asia, ten are in Africa, five are in the Middle East and five in Latin America. YOU'RE LIVING in the prophesied "time of the end," and that's not religious speculation. No one willing to face the solid facts of the DAILY NEWS can deny it — regardless of his spiritual bent or church affiliation. Great signs reach out to tell him (if he understands) that humanity is rushing rapidly toward unbelievable calamity — even human extinction. "This lifetime is also different from all others because of the astonishing expansion of the scale and scope of change. Clearly, there have been other lifetimes in which epochal upheavals occurred. Wars, plagues, earthquakes, and famine rocked many an earlier social order. But these shocks and upheavals were contained within the borders of one or a group of adjacent societies. It took generations, even centuries, for their impact to spread beyond these borders. "In our lifetime the boundaries have burst. Today the network of social ties is so tightly woven that the consequences of contemporary events radiate instantaneously around the world." We didn't write that. But it sounds like Matthew 24 in expanded and modern language. We are living in a world where no one can, or will, escape the cumulative impact of the world's wars, famines, pestilences, and earthquakes. And you find their effects everywhere you look! These things are the real PROOF this is the "end-time" — proof that isn't limited to the musty tomes of forgotten library stacks. It's not mystical testimony contained in the secret lore of Tibetan lamas, or exegetical ramblings confined to classrooms in comparative religion. It's not speculatory evidence circulated in "insider's letters" for select groups of prominent statesmen, or hidden in the book of Jasher. Rather, it's right out in the open — all around you. And there's certainly no doctrinal argument or theological debate involved one way or another. Let's look at headlines concerning just a couple of these signs. Let's take stock of just two areas — war and pestilence. That's the red horse of Revelation 6:4 to whom "power was given... to take peace from the earth, and that they should kill one another: and there was given unto him a great sword." "War? In these days of post-1945 peace?" you might ask. But there's been no peace since 1945. The world lives by war. "'At a conservative estimate,' says Geoffrey Kemp, of the arms control project at the Massachusetts Institute of Technology, about ONE-QUARTER of the sovereign states on planet Earth were engaged in interstate or intra-state conflict involving the use of regular armed forces as the 1970s began. "Kemp guesses that as many as 700,000 people have been killed in the internal wars of China in the past decade... and 250,000 in the Nigerian-Biafran civil war" (James Reston, The London Times, June 1, 1970). The official U. S. figures on the Vietnam war record an even more grisly toll — over 44,000 Americans killed, 11 7,000 South Vietnamese, and over 680,000 enemy troops. There are no figures on the civilian dead. Another bloody picture is in the Sudan, where the struggle of Negroes against Arabs has produced half a million casualties and dispossessed many more. James Reston comments, "Most nations do not even count their dead. The United Nations cannot make even the wildest guess at the carnage, and few intelligent people are informed about the number of wars and other uprisings now taking place" (ibid.). Peace since 1945? "100 Wars and Other Conflicts Since World War 11," reads an article title in the UNESCO Courier of November, 1970. The article lists more than 100 incidents ranging in scale from outright international wars and major civil wars to ones with differing degrees of conflict. Then there's the bomb — ever ominously looming in the background, unconsciously or consciously affecting our very life-style. The bomb is real — it's not just a tenet of religious reasoning. 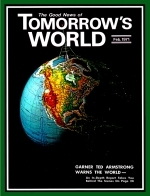 "If we continue to rely on the traditional forms of international security arrangements which have always failed us in the past, the odds are in favor of a major war within the next two decades..." (Dr. Jerome Wiesner of Massachusetts Institute of Technology and science adviser to three Presidents, in Seattle Post-lntelligencer, January 22, 1967). "So both sides are overkillingly armed to the teeth. Yet, both sides probably will expand their respective thermonuclear arsenals. For the arms race now feeds on itself" (Irving S. Benglesdorf, Los Angeles Times, Jan. 13, 1970). An AP release of January 19, 1970, matter-of-factly mentions that "for the first time in history, human beings hold the power to destroy mankind.... There are no precedents in political science or in history to guide men who command modern power." Jesus foretold it nearly 2000 years ago. Now war dominates your daily news. And you're living in that "time of the end." It is impossible to hide the fact or keep it out of the news headlines. Isn't that a problem of bygone ages? Don't disease epidemics only occur way off somewhere in Asia? Surely they couldn't occur in modern Britain or America, could they? Jesus Christ said the time of the end would be rife with pestilence. Of course some people think "pestilence" is restricted to wildly raging bubonic plague or similar diseases. But other parts of the Bible tell what forms "pestilence" would take — what types of disease the pale horse of Revelation 6:8 actually represented and what specifically Jesus meant. Notice Deuteronomy 28 where God said our national sins would "cause pestilence to haunt you... afflict YOU with wasting disease and recurrent fever, ague and eruptions... [strike you] with tumours, scabs, and itches... strike you with madness, blindness" (verses 21-28, New English Bible). So just for the moment let's skip the massive cholera threat in Asia, the Middle East and Africa (cholera appearing south of the Sahara for the first time in history). Let's skip leprosy in Africa, rabies in Europe, dysentery in Latin America, and globe-girdling diseases like malaria, trachoma, and schistosomiasis which affect almost one quarter of the population of the earth. Instead, let's look at the English-speaking people, theoretically so cozily divorced from the spread of disease such as among more primitive societies. Here are "highlights" from the daily news of 1970. "Venereal Disease in U. S. Called Pandemic," read a recent headline. Venereal disease presently affects 14 MILLION Americans and has reached "pandemic" proportions in the United States, according to the American Social Health Association. (Pandemic means everywhere epidemic.) Reported new cases of gonorrhea last year came to two million. Dr. James McKensie-Pollack, ASHA medical director, estimated the new cases of syphilis at 250,000. An even greater number of cases are believed diagnosed but not reported (UPI release, Los Angeles Times, November 16, 1970). Hospital-associated infections affect about 1.5 million Americans each year, said Dr. Alexander D. Langmuir, the Public Health Service's retiring chief epidemiologist in August (The New York Times, August 9, 1970). The Federal Center for Disease Control reported that pneumonia-influenza deaths have climbed slightly above the epidemic level in New England and the Midwest (UPI release, Los Angeles Times, December 13, 1970). "Astonishment of heart," your Bible foretold. The daily news states that more than one million Americans died of cardiovascular disease in 1967 (the most recent year for which data is available) (Family Health, March, 1970). "Wasting disease?" Degenerative afflictions? A clinical professor of medicine at Loma Linda University School of Medicine said the United States is facing an "epidemic of cancer." One patient dies of cancer in the United States every minute — about 1400 a day and about half a million a year (Los Angeles Times, February 20, 1970). Multiple sclerosis affects some 500,000 Americans (Catholic Digest, February, 1970). Arthritis afflicts more than 40 million Americans. Almost everyone over 50 gets it. It robs U. S. industry of more than 12 million man-days of work a year, costs over $4 billion in medical bills and lost wages, and cripples nearly one million people in the U. S. to a point where they cannot work (Business Week, April 25, 1970). Perhaps you noticed the two-part series in Today's Health (0ct.-Nov., 1970) by renowned author Philip Wylie, entitled "Who Killed Mankind?" The story is based on material from an "imaginary history" of the next 50 years which Mr. Wylie has "in the works." The author sees mankind decimated by a series of pollution-catalyzed disease epidemics between now and the year 2000 — with only one tenth of a peak population left to face the new millennium — Philip Wylie said that! And on go the reports, endlessly chronicling the tempo of today, eliciting the inescapable facts that show now is the "end time." It isn't just an idea that can be left to clerical speculation. Jesus said such a time would come to pass. And your daily news proves you're living in that very time — the "time of the end"!